Recently Diagnosed - Type 2 Diabetes Patient Where Do I Begin? Recently Diagnosed – Type 2 Diabetes Patient Where Do I Begin? First Steps to take after diagnosis of Type 2 Diabetes. 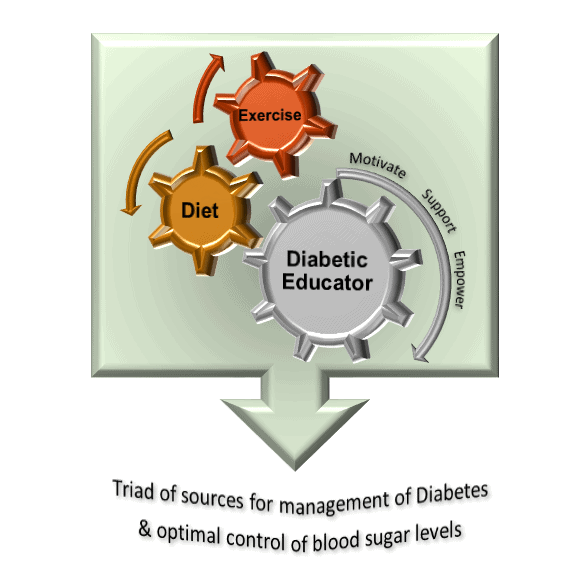 The three key sources: Diabetes Educator, Diet and Exercise are the mainstays of an effective diabetes management strategy. They are essentially like three wheels that engage together to move the whole engine smoothly. Collectively this three triad model is the principle influence for a holistic management of your symptoms and blood sugar levels. Diabetes Educator is the initial point of call and support when first diagnosed with diabetes. These health professionals specialize in ‘everything diabetes related’ and a fantastic source of information, motivation and support to meet all your needs for management of diabetes and helping you along the way to prevent its complications. Infact in our triad model of sources, Diabetes Educator is the main gear setting the other two wheels in motion in the right direction. Initially, when you are diagnosed with type 2 diabetes the Diabetes Educator will provide personalized advice on means and ways of improving your blood sugar levels to stay within the target range. Diabetes Educator can help you delay requiring medication and assist in the shift to using medication when insulin levels in your body eventually diminish. Indeed, these specialists are lifesavers and invaluable source in the entire journey of a diabetic patient. Diet is by far the most important single factor with direct influence on the sugar levels. With guidance and education on what will keep your sugar levels stable and reduce the chance of complications, food can become a friend not foe. Just remember to discuss any changes to your diet with your Dietitian, Diabetes Educator or Doctor. *Before undertaking on any form of exercise, it is important to talk to your health professionals and undergo a detailed medical screening for the presence of any diabetes related complications such as joint problems and cardiovascular issues. So now that you are diagnosed with diabetes the more you know about the symptoms, triggers and how to manage high or low sugar then the easier and less daunting will be the task of managing your diabetes long term. One of the best ways to take Type 2 Diabetes by the horn so to speak and protect yourself against its harm at every corner of your life is to develop a personalized tracking approach. Aside from the fact that a fitness tracking devise or app will motivate and boost activity, seeing the sugar levels stabilize will encourage continuous use. Activity does not have to be complicated; a simple walking routine and counting steps is the best way to stay on track. 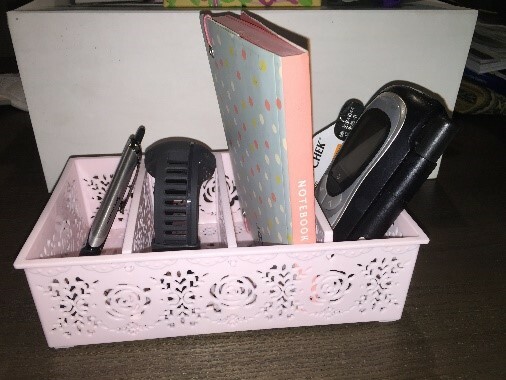 Different ideas to create your own personal diabetes kit. Diabetes Kit Blood Glucose Logbook is designed to help lower sugar levels with a tracking device as part of the Apple watch (see below). Mindful recording of your food, physical activity, medication and your mental state can have a significant impact on recognizing your weaknesses and taking action to change habits for optimal diabetes management. Store your kit at a convenient place to make it easy for access and recording. Sigal RJ, Kenny GP, Boulé NG, Wells GA, Prud’homme D, Fortier M, Reid RD, Tulloch H, Coyle D, Phillips P, Jennings A, Jaffey J. Effects of aerobic training, resistance training, or both on glycemic control in type 2 diabetes: a randomized trial. Ann Intern Med. 2007 Sep 18;147(6):357-69.
de Lade CG, Marins JC, Lima LM, de Carvalho CJ, Teixeira RB, Albuquerque MR, Reis JS, Amorim PR. Effects of different exercise programs and minimal detectable changes in hemoglobin A1c in patients with type 2 diabetes. Diabetol Metab Syndr. Bravata DM, Smith-Spangler C, Sundaram V, Gienger AL, Lin N, Lewis R, Stave CD, Olkin I, Sirard JR. Using pedometers to increase physical activity and improve health: a systematic review. JAMA. 2007 Nov 21;298(19):2296-304. Aizawa K, Maeda K, Ogawa M, et al. Comparative study of the routine daily usability of FoodLog: a smartphone-based food recording tool assisted by image retrieval. J Diabetes Sci Technol. 2014;8(2):203-208.